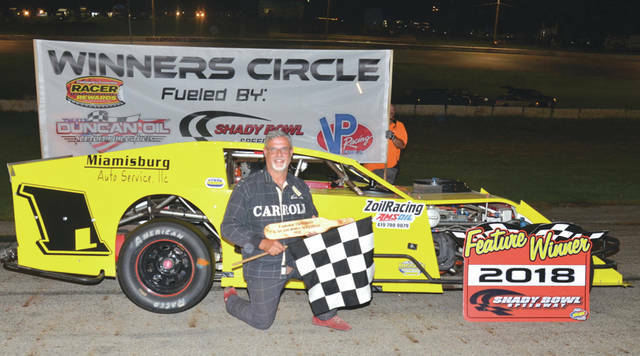 Mike Carroll of Cedarville won the 30-lap Biggins Small Engine Repair Modified feature race, Aug. 11 at Shady Bowl Speedway in DeGraff. DEGRAFF — Cedarville’s Mike Carroll grabbed the lead with 10 laps to go and held on for the win in the Biggins Small Engine Repair Modified class feature race, Aug. 11 at Shady Bowl Speedway. Carroll has won at least one other Modified feature this season. According to the Speedway website, Carroll currently sits seventh in the points standings out of 34 Modified class drivers. A full schedule of late model, modified, street stocks, hobby stocks and mini stocks, plus the first elimination round of the spectator drags, is set for a 7 p.m. start on Saturday Aug. 18 at the world’s fastest 0.3-mile paved oval. XENIA — The 10th annual Gathering of the Geezers old-time drag racing event will take place Saturday, Aug. 18 at Kil-Kare Dragway, 1166 Xenia-Dayton Road. Cars dated from 1987 or older will compete, and a car show for machines of any year will also take place. Swap meets, burnout contests, Nostalgia modified, street and street rod categories will race. Timed runs start 10 a.m., racing begins 2:30 p.m. Adult spectator admission is $15, kids age 12 and under get in free with a paid adult. For more information call Ed Crowder at 937-409-3087. BEAVERCREEK — The Beavercreek High School girls basketball program will be hosting its 20th annual Girls Basketball Fall League. The games will be played on Sunday afternoons starting Sept. 9 and ending Oct. 14. Cost per team is $75. All teams will play a total of seven games on five Sundays with no games on Sept 16. Each team will play at least two doubleheaders on two of the Sundays. For more information, email aric.seilhamer@gocreek.org. BELLBROOK — The Little Miami River Trailblazer Adventure will take place Sunday, Sept. 23 at Bellbrook Sugarcreek Park District Headquarters, 2751 Washington Mill Road. This is a fundraiser event where teams search for checkpoints along the Little Miami River. Each checkpoint will have fun information about the Little Miami River and its watershed. Teams are 2-6 or 2-4 person. Check in is 11 a.m. to 12 p.m. The event starts 1 p.m. To learn more about LMWN, the event and registration, or how to donate, visit www.lmriverkleeners.org.